A couple of generalized or multifocal disorders affecting peripheral nerves, plexus and motor-neurons may occasionally mimic focal neuropathies. Despite the fact that most of them are rather uncommon or rare, an erroneous diagnosis may mean that patients will undergo non-indicated surgical interventions or other therapies without benefit or even that they are harmed in a worst case scenario. Therefore, knowledge of these diseases will help to avoid misleading diagnoses. Moreover, after the first failed surgery this should always kept in mind as a part of an extensive differential diagnostic approach. 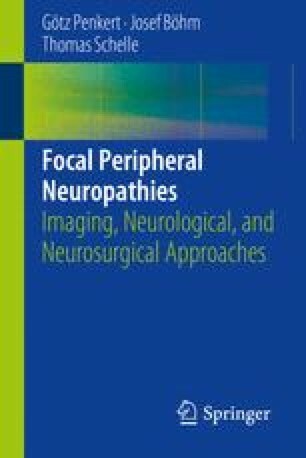 The following chapter highlights some essential facts about motor neuron diseases, diseases of brachial and lumbosacral plexus, hereditary neuropathies, autoimmune neuropathies and vasculitic neuropathies so that physicians can differentiate generalized multifocal from focal neuropathies clinically, and furthermore understand the essential diagnostic pathways, such as different imaging techniques and nerve conduction studies. Zaidman CM, Pestronk A. Nerve Size in CIDP Varies with Disease Activity and Therapy Response Over Time: A Retrospective Ultrasound Study. Muscle Nerve. 2014 Feb 25. doi: 10.1002/mus.24227. [Epub ahead of print].